We’ve hit the end of week #3 in our marathon and the momentum is continuing with more and more runners joining in. We had a great turn out on Friday afternoon with our students as well as some of the hospital staff joining in for the celebrity run. At the end of week #3 we are up to a total of 492 miles run for the MAF Marathon. That’s about 19 complete marathons! Christian Radio Missionary Fellowship (CRMF, www.crmf.org) works under the umbrella of MAF International in Papua New Guinea. Reaching out with Christ's love to help people in remote communities by; providing a reliable means of HF radio communication, IT and technical expertise and relevant new technology such as solar powered light kits. CRMF has a new ministry 'Learning Technologies PNG' (LTPNG). It has many roles but primarily we aim to help pastors and church leaders have access to theological training and discipleship resources, and also to give people in remote areas access to God's Word via the printed bible or on audio devices or, with our latest attempt, via WiFi. The mobile market is growing worldwide. The increasing number of mobile phones and smart phones is also the trend in PNG. 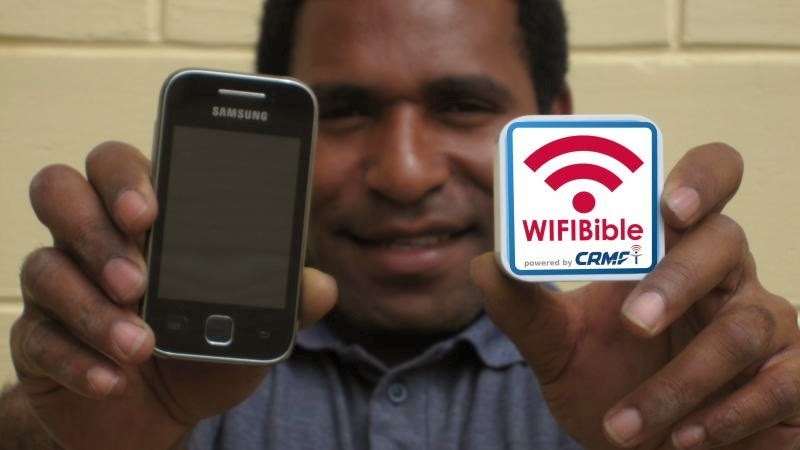 CRMF is creating a new product to make use of this trend to spread the Word of God: The WIFIBible! The WIFIBible is a small wireless device, which provides audio bibles, digital bibles, Jesus film and APPs, free to download. That means that people close to this device can get a free copy of the TokPisin bible on their mobile phone. CRMF will install the first WIFIBibles in the PMVs, so that people will have the opportunity to explore the content while they are travelling. At a later stage we hope to install them in other places as well, like MAF bases, MAF planes and market places, anywhere people are sitting and waiting. In the end we hope to bring the WIFIBible even out to the bush. It will be an opportunity for the remote PNG people to get their own free copy of the text bible or of the audio bible. This is also a technique to reduce the occurrence of false teaching, which was detected in a CRMF survey as the number one concern of the pastors. To bring the WIFIBible to the bush is still in the early stages, but we are convinced that in the near future even the man from the bush will own a smart phone. · The potential for CRMF and LT PNG to grow its ministry presently seems quite large. However this comes with its challenges. Please pray for these challenges such as finding the right staff, office space, housing and finance for all of this. · We have a number of HF radio installations that need to be done before the end of the year. Please pray for wisdom for the management team as they work out the logistics involved with these installations and that the installations will occur in the required time. · We would value your prayers for our office staff and for Michael the General Manager as they are keeping all the accounts and administration tasks running without an Administrator. Pray for strength and diligence for them all. Praise God for providing Billy, a PNG national accountant who will join us at the beginning of next year to become our Administrator. · Please pray for the spiritual protection of all our CRMF families as when you work in ministry you are often under spiritual attack. What’s the precious cargo loaded in the pod of the Airvan that everybody is pointing at? Why does it make pilot Andy Little get excited about his next flight? Flights for educational support are regular events in the MAF Papua New Guinea program. The delivery of educational material is remarkably consistent throughout the year, with a similar number each month, but it is not restricted to any particular weeks. The true “bush schools” are usually primary schools and generally they use less material. However, many of the remote high schools need extra support in the way of books and other supplies as well as building materials. The Oksapmin High School at Tekin, Sandaun Province, is another school which gets regular flights from MAF. Just recently the Twin Otter flew building materials from Tabubil for the extension of the high school. Our Wewak-based Airvan regularly flies in supplies for the boarding school. During every term break, Glenda Giles, founder and teacher at the high school flies with us for a break at Wewak. HERE is a link to an article about this year’s Grade 10 Graduation at the Oksapmin High School. For several days in December and February our planes are often fully loaded with teachers, students and educational materials. During the rest of the year the request is more on a charter basis for transporting educational and building materials or supplies for boarding high schools and exam papers, which have to be flown out of the communities in time for central marking. · Please pray for safe and smooth MAF operations during the end of the school year as there are many requests for students and teachers to be flown to their home villages. · Pray for the students and teachers that they can have good rest during the upcoming holidays and that they have a good time catching up with family and friends while home, before heading to school early 2015. · Think of all the graduates as they now wait for their results, which are vital for their further education – either continuing year 11 and 12 and finishing high school or for applying to university or other further education. One of the most important types of flying that MAF-PNG does is that of subsidised flying for Church and mission groups. Many remote churches in the country have access to subsidised flights because their Church Organisation is registered with MAF. The same applies to Mission and Bible Colleges. MAF-PNG partners with 81 churches, missions and Christian organisations including, i.e. Anglican Church, Assemblies of God, Association of Baptist for World Evangelism, Christian Brethren Churches, Church of the Nazarene, Salvation Army, Bible Translator Association, South Seas Evangelical Church, United Church, World Vision International, and Youth with a Mission, to name just a few. The total of subsidies paid by MAF in the year amounts to over 1million Kina. Colleges like the Christian Leaders’ Training College and the Melanesia Nazarene Bible College outside Mt. Hagen both focus much effort on training up young men and women to be pastors and teachers at remote churches, schools and bible schools. Each year hundreds of pastors graduate from these and the small isolated student bible schools in remote PNG communities. They are still unable to meet the huge need for trained and informed pastors to lead the churches with strong biblical teaching. For these churches to grow they need to be led with wisdom and honesty in order to address the many challenges and pitfalls of false teaching, fraud and corruption. It is MAF’s goal to make travel available for these new pastors to get back to their home communities where they can value-add to the struggling churches. MAF recently flew ex-missionary Les Loader to the Guala bible school to install solar panels for lighting at night for students to study by, and to have power during the day for their training sessions. He has also held a Bible Teacher In Service Course at Kelabo for previously trained teachers and pastors. Another ex-missionary, Dan Anderson, went out from CLTC to run English refresher courses at the small Kelabo bible school. Without MAF these trainers would have to carry heavy loads and walk, or withstand hours on bumpy roads in trucks that cover the distances between towns and these remote communities to give back-up and support to isolated pastors. Give thanks that MAF leadership is encouraging the call by staff to be involved in personal ministry work in the remote churches where the need is great. Pray that MAF would be able to raise sufficient funds from overseas donors to continue supporting strategic partnerships with the churches and missions of PNG in the work they are doing to extend the Kingdom. That more PNG men and women would respond to God‘s call to become pastors and teachers and be available to go back to their communities to take the Good News, to dispel false teachings and strengthen the church with God’s truth. That the remote churches will listen to those strong enough to stand against the introduction of cargo cult tendancies and other occult practices. Love letters are easiest to understand and most effective when written in somebody’s heart language. It’s the same with God’s Word. The Bible is God´s love letter to mankind. After about 30 years of hard work the Tay people at Yimnalem, a remote village in PNG and only accessible by air, now have God’s love letter in their own language thanks to the work of missionaries of Pioneers Bible Translators. Read the full story HERE. MAF connects with over 60 Christian and humanitarian organisations in PNG. Our flights and other services help to keep them running so that more remote people can receive the help they need and, most important of all, hear the Good News of Jesus Christ. Just recently MAF was able to be part celebrating another two Bible dedications. One with Summer Institute of Linguistics (SIL) – click HERE for the full story – another one with New Tribes Mission (NTM). Celebrations like these in the end have just been a reflection of what happened many years ago leading up to this special day: men were travelling long distances to ask for missionaries to come into their village, to learn their language and culture to finally tell them the Good News in their heart language as well as of many flights into remote areas to enable the missionaries to do their work. 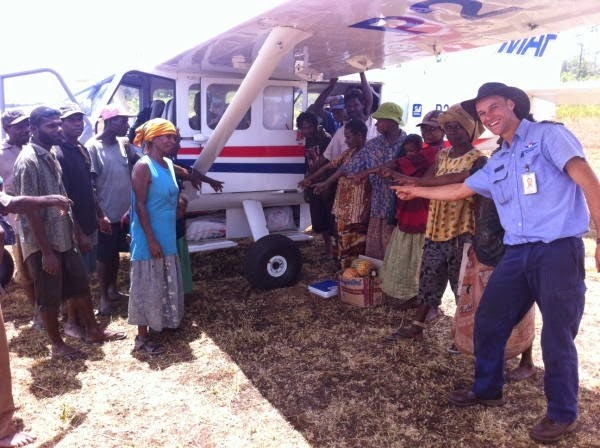 Another of MAF’s key customers is New Tribes Mission as they are short of pilots so the MAF planes are loaded with cargo to support their missionaries out in the villages. NTM has up to three families based in one tribe. Often the missionaries are MAF’s passengers, sometimes accompanied by local language helpers or NTM staff going to visit the villages for language or translation checks. Sometimes it’s family and friends from home, or people of the supporting churches who fly out there to encourage their friends. HERE you can read of a mission trip by a young American who came to PNG for a look-see trip to find out more about mission work. And of course, there are flights for building materials as well to support other missions. For example: A team from SIL/Wycliffe is stationed west of Aitape in Arop, living with the people of the Sissano language group, working to study their language and translate the Bible. This area was badly destroyed after a severe earthquake overwhelmed it with a tsunami in 1998, in which about 3000 people were killed. For this project a lot of building materials were flown by MAF to Tadji, which is the nearest landing place to Arop. From there, they still travelled for half a day by truck and canoe. HERE is a link to watch a movie about this language group. 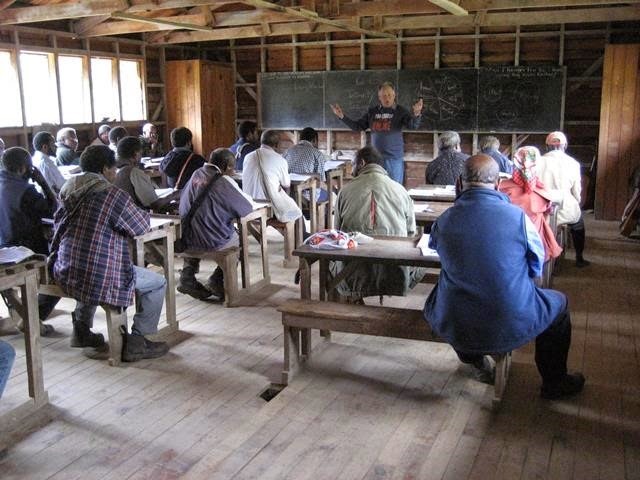 · Please pray for the missionaries based out in the remote villages of PNG. Pray for good health, for good relationships within their team and the local people. · Pray that the missionaries are a good testimony for the locals and have wisdom to understand their language and culture to be able to translate God’s Word into the different heart languages for the tribe they are working with. · Pray for the small churches planted in isolation by missionaries that they grow strong in their faith and the believers can completely let go of former beliefs, fears and customs. · Pray for a good partnership as MAF is serving other missions. · Please pray that people listen to the call coming and serving in the mission field – as Bible translators and church planters, as maintenance assistants, accountants or whatever profession is needed to support the local churches here in PNG. MAF is supporting efforts to combat the deadly Ebola outbreak in the Democratic Republic of the Congo (DRC). Our aircraft have been involved in transporting medical personnel and supplies into the remote Boende district of the DRC. According to the DRC Minister of Health, cases of Ebola have been confirmed in the area, including deaths. MAF has nine aircraft based in DRC—in Kinshasa, Lubumbashi, Bunia, and Nyankunde. From these bases we fly to remote regions of the vast country, using small, rugged airstrips to serve isolated communities. In the DRC MAF supports the work of 170 churches, medical organisations, relief agencies, and others seeking to make life better for those who live in the DRC’s jungles. This is not the first time that MAF has responded to Ebola threats. In the 2007 and 1995 outbreaks in the DRC, our planes and people played a key role. We are experienced in such situations and have a plan in place to minimise the risk. MAF’s Ebola Pandemic Management Plan contains procedures for safely carrying people, materials, and specimens to and from Ebola hot zones. 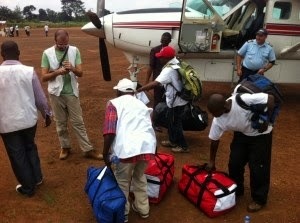 The Ebola response in the DRC is wrapping up. According to Nick Frey, West DRC program manager, no new cases have been reported since early October. If no additional cases are identified by Saturday, November 15 (42 days since the last confirmed case), the outbreak will be considered to have ended. Please join us in giving thanks that this outbreak in the DRC is ending, also giving thanks for our staff and the medical personnel who have faithfully served. Continue to pray for those who have lost loved ones to Ebola, as well as those suffering through the ongoing Ebola crisis in western Africa. MAF is trying to set up a new operation in Liberia, but the Ebola outbreak slowed the process down. Praise God that it would appear that the number of new cases of Ebola is decreasing in Liberia. Pray that this will continue. MAF still does not have all the paperwork needed to start flying there and there is no reliable information on when the government workers will return to their normal activities and when we are likely to get the necessary approvals etc. Please continue to pray for this situation and those people in Liberia assisting us with this process. Please pray that the Ebola crisis will reduce to the point where we can complete the permissions, process and then safely assign staff to Monrovia. Emil Kündig, (Country Director & Chief Pilot) & wife, Margrit, (Finance & Admin) are currently in Uganda where Emil is waiting to sit his Uganda pilot and engineer exams so that he can fly the Uganda-registered plane and do regular maintenance on it when we begin operations in Liberia. Margrit has just returned following her shoulder surgery and is arranging the ongoing physio-therapy she will need. Please pray for her and for a full recovery. The other pilot family, Arjan & Aartje Paas are on a temporary assignment in South Sudan. Do pray for these two families who have to cope with these frustrating delays before they can re-locate to Monrovia and begin the flight programme there. They are in a very temporary situation without their personal effects (which have been shipped to Liberia) so life is not easy for them.